From now on, I’m hoping to post spinning stuff on Mondays, so welcome to my first “Spinning Monday”! Today I’m going to show you what I finished just a few days ago. This is the Mystery Bump from Still River Mills that I purchased at the Connecticut Sheep and Wool back in April. I was attracted to the various colors of the bump; yellow, cherry red, purple and black. I was a little disappointed when I noticed that the first two colors were only at the beginning of the bump and nowhere else. The rest of the bump was just black and purple, although it was pretty nonetheless. The bump was a mix of alpaca and Border Leicester and/or Romney. It was quite easy to spin and the alpaca was super soft. I decided to spin 3 2oz sections and 3-ply them together. 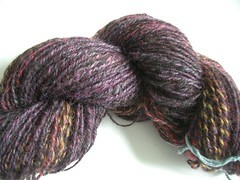 The resulting yarn was about 250 yds of DKish weight. You can see if you click on the picture to make it bigger a bit of the yellow and cherry red sections. I bought this roving along with a drop spindle last summer and I believe it is Ashland Bay Trading Co. colonial wool top. Once I’m done spinning it I will ply it together with the rest of the mystery bump. 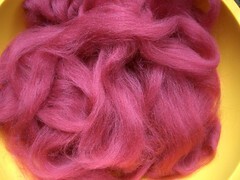 I am tempted though, to 3 ply it with the pink merino I received a while back. I wonder what it will look like?